2/65 Kim Hollis I have a really hard time choosing between this and The Queen for the second spot. I might change my mind tomorrow. 3/68 Michael Bentley With Jack, Matt, Leo and Marty it's almost as awesome as you might imagine. It loses some steam and focus near the end though. 4/52 Les Winan Absolutely outstanding. Fantastic work by the entire cast. It's easy to forget just how good Nicholson is. Scorcese is at the top of his game. 5/159 David Mumpower Marvelous adaptation of equally wonderful Infernal Affairs is gritty character study of the constant gamesmanship of felons and cops. Feels like a Best Picture winner. 10/47 Amanda Jones Competent almost to a fault. A very good movie that lacked the heart to be great. 26/200 Max Braden The acting is good but the editing is problematic. Infernal Affairs, a Andrew Lau movie about sleeper mobsters within the police force, cleaned up at the Hong Kong equivalent of the Academy Awards. Perhaps it's not surprising to hear that the movie is being adapted as a North American remake. The cast might get your attention, though. The original told the stories of police and mobsters, two sides eternally locked in psychological as well as physical combat. At roughly the same time, both parties came up with the same idea. They will recruit a young boy to infiltrate the other organization. A lifer would draw less suspicion and more easily manage to attain inside information about their natural enemy. Over time, both double agents discover the existence of their opposition, leading to a dangerous game of pursuit and escape between the warring spies. Hollywood is now ready to mine the themes of this film for their own usage with its Americanized take on the proceedings, The Departed. Legendary director Martin Scorcese seeks to put the torture of Gangs of New York behind him and move on with a movie of greater depth but similar undertones. This take on the ideas of Infernal Affairs involves the New England Irish mafia and their constant struggles with the local police. Titanic drownee Leonardo DiCaprio and recovering amnesiac Matt Damon are poised to frontline this production. DiCaprio portrays an undercover cop who has managed to infiltrate the highest levels of the mob. 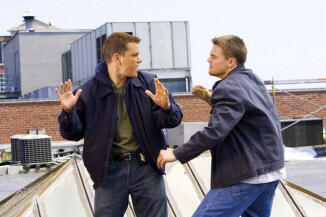 Damon plays his counterpart, a gangster who has been selected to join the local police academy. Both agents work with the same purpose in mind. They are to learn all functional details of the enemy, using them to improve the position of their respective organizations during this eternal struggle for control. Eventually, each becomes aware of the other, causing them to seek to flush one another out before the competing mole can reveal their hidden duality. See the latest developments for this project on the The Departed Movie News page.